One of the latest crazes in Virtual Pets is linking pets. We will be providing product reviews and information about them on this page. If you are manufacturer or a major distributor of a linking virutal pet and would like your pet reviewed here, please email us by clicking on the mailbox at the right. Also if you are aware of any linking virtual keychain pet that is not listed, please E-mail us. Bandai's long awaited re-entry to the Tamagotchi market. It features an infrared link allowing it to link with other Tamagotchi, play games with them, give and recieve gifts, and even mate to produce baby Tamagotchi. 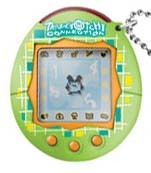 We have full coverage on our Tamagotchi Connection Information Center page. The much awaited male and female pets from Bandai. The photo here was "borrowed" from Media Magic which has an excellent diary of a pair of the pets (note it is in Japanese but you can see some great photos there). Bandai has posted a life chart on their Japanese page. The top chart is for Osucci and the bottom one is for Mesucci. 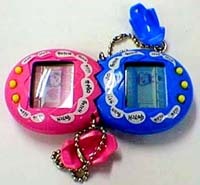 These pets were fore runners of the Tamagotchi Connection infrared linked pet released in 2004. Linkable kitten pets. They grow and have the normal pet functions. Additionally they can play games, become friends, and even marry with similar pets through a cable connection. They even reproduce themselves after becoming pregnant through the connection. We have tested and reviewed this pet. Linkable dinosaur pets. They link to mate (after age 6) and also to "babysit". These pets come in great packaging and are a unique "pager" or "beeper" shape. They play a fruit game and reproduce. We have tested and reviewed this pet. The just released (Dec 18, 1997) Nano Fighter pet. We have tested and reviewed this pet. Bandi's linkable fighting pet. We have a "guest review" of this pet along with some comments and photos. A fighting pet similar to the Digital Demon. 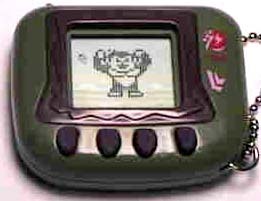 It has some nice features of "weight lifting" and "quickness exercises", plus it can play a "man vs. computer fight game" when you cannot find a friend to link to. We have not reviewed this pet, but do have some literature and photos posted. A 6 inch tall, transformer type toy with a LCD in his stomach. These interactive fighters by Cooltec are to be out in April 1998. We have not tested or reviewed this pet but do have some additional information about it. The first linking fighter pets to do battle on both LCD screens. We have not tested or reviewed this Cooltec pet but do have some additional information about it. We think many new developments will soon be occurring in this area such as infrared linking pets (they link by infrared signals and do not require a cable or case connection). We can also envision several specialized pets that could be both fun and educational. Maybe a doctor pet, a fireman pet, a dentist pet, a baby sitting pet, a teacher pet, a coaching pet for the fighters? These pets could be connected to other more general linking pets and take care of their needs. Maybe one "wizard pet" could perform a number of these "special functions." Then pets owners would have to find the wizard to enlist his help? Maybe these linking pets could somehow interact with a computer, the internet, with a dialed up telephone number, or a television or radio broadcast. The pet could either just respond (as one of the TV toys now does) or actually download information to change its behaviors. The possibilities are endless. It would be nice if the manufacturers could standardize on some linking parameters so different kinds of pets could link together, but right now the market is to chaotic for that to occur. Manufacturers are racing to bring pets with new features to market as fast as possible. Maybe if one style of pet eventually begins to dominate the market, others will adapt to its connection parameters (similar to what IBM did to PC computer standards)? Anyway, right now it is a very interesting and dynamic part of the already hectic virtual pet industry.